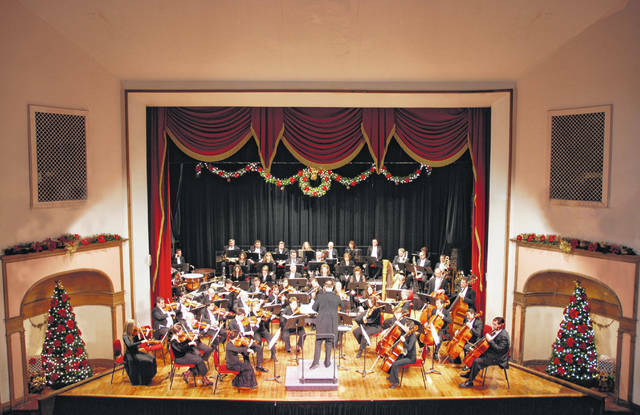 The Ohio Valley Symphony annual Christmas Show comes this Saturday. GALLIPOLIS — Who will be the next Maestro for a Moment? Gallia County Sheriff Matt Champlin and local physicians Brett Powell and Rajesh Rajan will be vying for the chance to conduct The Ohio Valley Symphony in Sleigh Ride by raising the most funds by intermission of this Saturday’s Christmas Show at the Ariel Opera House. “Maestro for a Moment” is the annual campaign of The Ohio Valley Symphony, resident orchestra of the Ariel-Ann Carson Dater Performing Arts Centre, to promote awareness of symphonic music and raise funds to support live OVS performances on the historic Ariel Opera House stage. To get a perspective on making music, the public is welcome to attend OVS rehearsals for free at 7-10 p.m. Friday, Nov. 30, and 1-4 p.m. Saturday, Dec. 1. Open rehearsals are a way for young and old alike to become more familiar with symphonic music, and they offer a behind-the-scenes glimpse of what goes into preparing an orchestral performance. The Christmas Show starts at 7:30 p.m. The evening begins with a pre-concert chat at 6:45 p.m. led by Steven Huang, director of Orchestras at Ohio University. 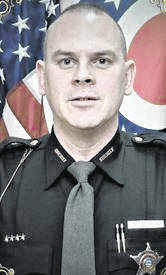 Gallia County Sheriff Matt Champlin is a 1996 graduate of the Gallia Academy High School in Gallipolis and a 1997 graduate of the Ohio Peace Officer Training Academy. After completing the peace officer academy, Champlin worked in several different sectors of public service including work as a dispatcher at the Gallia County 911 Center, a probation officer with the Gallia County Juvenile Court and a deputy sheriff with the Gallia County Sheriff’s Office before, being hired by the Gallipolis Police Department as a patrolman in 1999. Champlin worked with the Gallipolis Police Department over a period of 18 years working in such specializations as a canine handler, a narcotics investigator and a clandestine lab technician. Champlin received two promotions during his time with the Gallipolis Police Department first to the rank of sergeant in 2005 and finally to the rank of lieutenant in 2010. On November 8, 2016, Champlin was elected by the citizens of Gallia County to replace the two term incumbent sheriff. 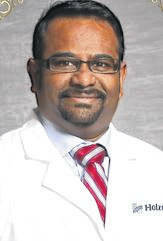 Dr. Rajesh Rajan, of Holzer Health System, specializes in hemodialysis, chronic kidney disease, hypertension, kidney stones and preventive care for kidney stones, acid base and electrolytes, peritoneal dialysis, kidney biopsy, and interventional nephrology, according to the system’s website. He is a graduate of Ross University School of Medicine in Dominica, West Indies, served his residency with the Orlando Regional Medical Center and a fellowship with Washington University in Saint Louis. “My background in music consists of having enjoyed several concerts and musical performances, and have tried to learn to play the drums. Both of my children take singing lessons and my wife sings at social gatherings. I enjoy listening to various genres of music whenever I can – it keeps me released in this fast-paced work – though my favorites are classical and Indian,” said Rajan in a statement to the Ariel Opera House. Representing Pleasant Valley Hospital is Dr. Bretton Powell. His specialty is internal medicine for adults, according to the hospital website. 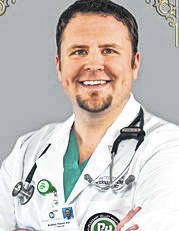 He has a medical doctorate from Marshall University Joan C. Edwards School of Medicine and served an internal medicine residency at Riverside Methodist Hospital in Columbus. Tickets for The Ohio Valley Symphony’s concerts are $24 for adults, $22 seniors and $12 for students. The price includes the pre-concert chat, the concert and the reception immediately following. Tickets are available on the website at ohiovalleysymphony.org or at the box office. Vote early and vote often by sending checks to OVS at PO Box 424 Gallipolis, Ohio or go to the website at arieltheatre.org and cast your monetary vote online.